Someone once said that Ligeti is the way metal is meant to sound. In principle I agree, if we're talking about that visceral, bodily and emotional state that really great metal can engender. 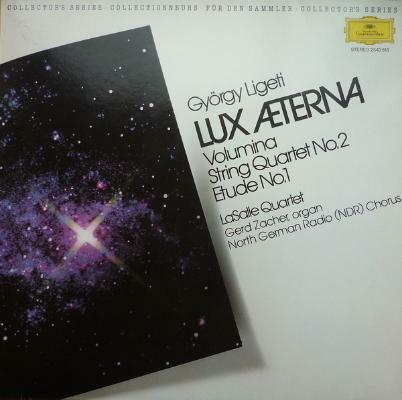 Ligeti is all that and more. His music, particularly the pieces on this edition, are about wholly consuming every aspect of the self and giving over completely to the music. There are moments in Lux Aeterna where I am in a place so holistic I can't really do the sensation justice in words. Every part of me is activated and consumed by the music and the clusters of harmony are no longer voices or instruments, they are something else entirely. If I were a religious man, I'd say they were almost immaculate. Ligeti sums up what I love about the possibilities of choral music and orchestration. These are instruments and sounds we know and love but in Ligeti's hands they become something else. They draw us through expectation into another place and another way of hearing them. I love that sensation in other albums, too, like My Bloody Valentine's Loveless. You know the source is guitars but you are drawn through that understanding to reconsider them entirely. I don't underestimate the importance of that blurriness in music. Refusing the absolute and allowing the not knowing is so important. This music also resonates strongly for me thanks to Stanley Kubrick's brilliant use of it in 2001: A Space Odyssey. Those sequences in the film are so powerful and remarkably affecting that to this day they recur regularly in my mind's eye and ear. And what incredible sound design in that film. So brutal and unforgiving but exactly as it should be. I could watch it again right now!